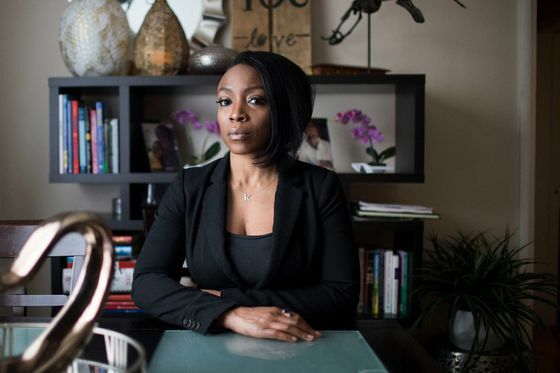 The 43-year-old single mother is about C$100,000 ($75,000) in debt, mainly from student loans to fund nursing and kinesiology degrees at Toronto’s York University. The loans might have been manageable if she hadn’t had to turn to credit cards to help cover other expenses: tutoring for her 14-year-old son; assessment tests for him; and private school to help him overcome learning difficulties. The breaking point came in 2017, when she realized she couldn’t make even the minimum payments on her credit cards. Household debt in Canada, a nation generally known for moderation, has reached levels that could be qualified as excessive. Canadians owe C$2.16 trillion—which, as a share of gross domestic product, is the highest debt load in the Group of Seven economies. With the housing market cooling, a reckoning may be fast approaching. People are “freaking out,” even though, with interest rates not far above historical lows, “money still costs nothing,” says Scott Terrio, a Toronto-based manager at Hoyes, Michalos & Associates Inc., a company that specializes in insolvency. Until recently, Canada had been lauded as a bastion of sound financial management. The country of 37 million emerged relatively unscathed from the global financial crisis, thanks in large part to the strength of its banks. But the extended run of low interest rates that followed sparked a boom in borrowing, with the ratio of debt to disposable income rising to a record 174 percent in the fourth quarter, from 148 percent a decade earlier. Now everything is downshifting. The Bank of Canada has hiked the benchmark interest rate five times since mid-2017, to 1.75 percent. Federal and provincial governments have enacted a raft of rules in recent years to tame housing speculation. The policy changes are having an effect. Home values fell in 2018 for the first time in three decades, and the slide has extended into this year. Households are feeling the strain. The debt service ratio—a measure of how much disposable income goes to principal and interest payments—climbed to 14.9 percent in the fourth quarter, almost matching the 2007 record high. 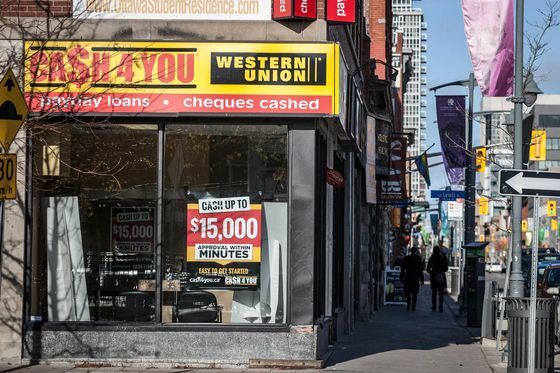 A total of 31,900 Canadians filed for insolvency in the three months through December, the most since 2010. Credit growth is running at its slowest annual pace since 1983. That dynamic may already be playing out. Delinquencies on auto loans hit 0.97 percent in the final quarter of 2018, the highest since the aftermath of the 2008-09 recession, according to credit monitoring company Equifax. Data also show a pronounced shift to leasing, as rising interest rates make it less economical for manufacturers to offer cheap longer-term loans. Leases accounted for 36 percent of the C$7.85 billion in new loans from auto financiers in the fourth quarter, the biggest share since before the financial crisis. “We’re starting to see consumer behavior shift to keep the payments as low as possible,” says Bill Johnston, vice president at Equifax Canada. Another pocket of vulnerability is Helocs, short for home equity lines of credit. Helocs played a supporting role in the U.S. housing bubble, as Americans tapped the rising equity in their homes for cash. In Canada, borrowing through Helocs has grown faster than residential mortgages since 2017 and stood at C$243 billion in October, or 11.3 percent of total household debt, according to DBRS Ltd. The credit rating agency warned in February that if real estate prices fall, homeowners may find themselves with debt loads that exceed the value of their homes. Like Maxwell, many Canadians are getting trapped in the debt cycle even before they enter the property market. After William Weathersby lost his IT job in 2012, he turned to a payday lender and ended up juggling C$12,000 in high interest loans, as well as credit card debt and tax arrears. He filed for insolvency two years ago. “It really just caught up with me,” says Weathersby. He eventually found work at a call center. Striking an agreement with creditors to pay only a portion of the debt “basically saved my life,” he says. Some of the riskiest practices that set the stage for the U.S. housing bust, such as Ninja loans—no income, no job, and no assets—are nonstarters in Canada. Another brake is that unlike in the U.S., mortgages are “full recourse” in most of Canada, meaning lenders can pursue borrowers even after they’ve walked away from the property. For Maxwell, owning a home is a long-forgotten dream. Refusing to file for bankruptcy, she went to a credit counseling service that helped her budget and negotiated a repayment plan with her creditors. Her investment in getting a degree is starting to pay off: She’s got an C$80,000-a-year job with the Ontario Nursing Association. If all goes well, she’ll be able to pay off her existing credit card debts in two years. The almost C$90,000 of outstanding student loans is a hurdle she’ll clear later, she says. Money is tight, though, so much that when Maxwell wanted to take her son to Cuba as an eighth-grade graduation present, she had to borrow from family.